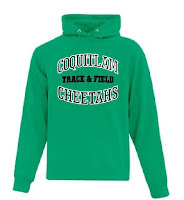 Coquitlam Cheetahs Track and Field Club: Cheetah-Wear has Arrived! The clothing shipment will be arriving to the shed Monday June 4th late afternoon and will be available for pick-up Wednesday June 6th and Thursday June 7th from 6:15pm until at least 7:00pm. Pick-up may even be possible on Monday once the shipment has been received and organized - families are welcomed to drop by the shed to inquire. For expediency, please refer to the name of the person who ordered (and paid for) the clothing if different from the registered athlete(s). Any clothing not picked up this week can be collected from the event admin team at the shed during the Jesse Bent Memorial meet June 9th and 10th.